It's starting to feel like you're completely on your own down there. At around 9:40 p.m., Saturday, a few friends and I went the the McPherson Square station and were on the Vienna-bound platform. We saw a large piece of luggage sitting on the other side of the tracks. We didn't think anything of it at first, but about 10 minutes went by, and the bag still had no apparent owner. I noted that it looked sketchy, and my friend L. suggested we say something to the station manager. L. and I went up to the station manager and stood outside of the door for about 30 seconds before we knocked. The two women inside were talking and saw us, but made no attempt to help us until we knocked. I told the lady that a large bag had been sitting unattended and she barked "yeah okay!" The other lady asked what color it was. As I told her it was red, she slammed the door in my face. I knocked on the door again to let them know which side of the tracks the bag was located, she yelled "Yeah, I said okay!" and slammed the door again and continued to ignore us. 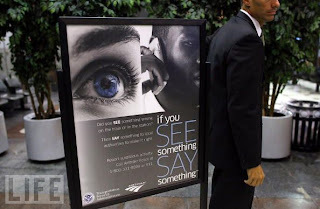 So much for the WMATA advertisements of "see something, say something." A few minutes later it looked like somebody was standing close to the bag, so maybe he was the owner. Regardless, we never saw any of the station managers or security people on any of the platforms. Our train came, so we never found out what happened with the bag. So much for doing my part!